The product of choice by homeowners, builders, and contractors, who demand longevity, elegance, and an overall excellent value. 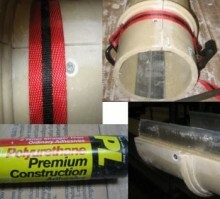 There are many benefits of a composite column over ordinary wood columns. Firstly composite columns are weather resistant, insect proof and water proof and can be used both indoors and outdoors without worry. You can throw your worst at them and they will not rot or dent. Wood columns can be used outside but they require more care and will not last nearly as long before they need painting or even replacing. Unlike wood columns that are spun on a lathe, these fiberglass columns are cast from a mold and tend to have more of a architecturally correct bulge as the ancient Greeks and Romans intended. 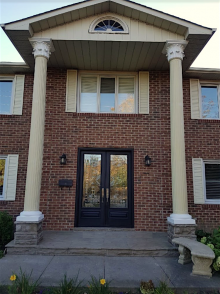 Our Tuscan columns can also be used inside the home; their unique look will set your home apart from that of your neighbours. 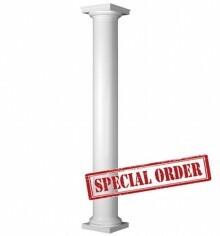 Some columns sold at the Big Box stores are tapered but they lack the feminine curves of the Tuscan column. These curves give the impression that the columns are under great pressure from a load up above. 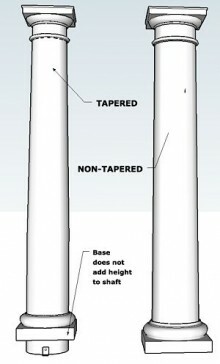 You will notice that the bottom of a Tuscan column is a little wider than most and the taper to the top is much more defined. The bottom also features a robust base that is reminiscent of the architecture found in the Tuscan region of Italy. 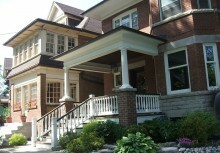 We currently offer the Tuscan Composite Columns smooth or fluted. Each column comes with the Tuscan Capital and Base. 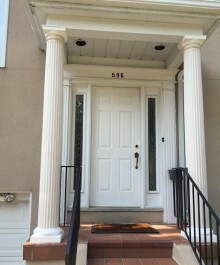 Fiberglas columns are easy to work with and can be cut with any hand saw, they come unfinished however they will accept paint or faux finish readily. 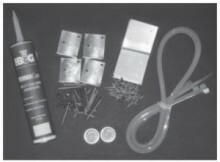 Larger columns can be found on other pages within this site.